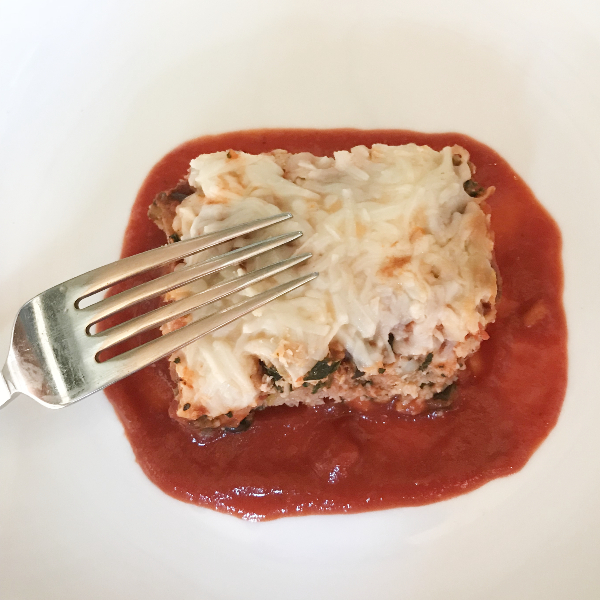 On Tuesday, I shared a recipe from the Think Tasty archives for Individual Spaghetti Squash Lasagnas. 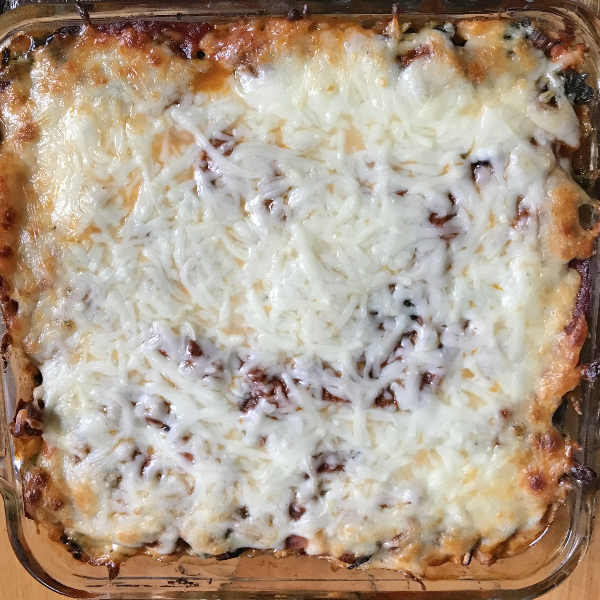 That version of lasagna definitely is healthier than regular lasagna, as all of the noodles are replaced with spaghetti squash. This recipe takes it a notch higher on the healthy scale while still keeping the dish delicious. How did I do that? First, I replaced the lasagna noodles with cauliflower that’s been blitzed in the food processor and steamed. Second, I removed the ricotta layer. Third, I used less mozzarella per serving. How did it taste? After reading the second paragraph, you may be thinking that it sounds disappointing. It’s not. The cauliflower produced a thicker layer that had an element of creaminess, which replaced both the noodles and ricotta. Although there’s less mozzarella per serving, you really don’t notice it with all of the other flavors and textures. When would I make this dish? If you are a regular reader, you probably know that my cooking is usually weather-based. That might make you question how a lasagna recipe got created in the summer. In between two hot spells, we had one day with tons of rain and cooler temps. I grabbed that opportunity and made this dish, as I had been imagining it for a while. Typically, however, this dish wouldn’t be part of my repertoire until the chill of fall returns. What would I change? Honestly, I love the dish as it was. I thought about adding some faux meat crumbles, but the cubed eggplant provided a nice amount of texture. If you aren’t an eggplant fan (How is that possible!? ), I’d suggest substituting with mushrooms. Other than that, I’d leave this recipes as is. It was utterly delicious. Measure 5 cups of cauliflower, and transfer to a large microwave-safe container; cover with lid or plastic wrap. Microwave on high for 5-7 minutes or until cauliflower is tender. Wrap cauliflower in clean kitchen towel and squeeze until all liquid is removed. Add parmesan, egg whites, oregano, basil, and salt, and stir until well mixed. Heat a large nonstick pan over medium heat. Coat bottom of pan with nonstick cooking spray or extra virgin olive oil. Add cubed eggplant to pan, and saute for 5 minutes. Add minced garlic and saute for 1 more minute. Squeeze excess liquid from spinach. Spray an 8×8 baking pan with nonstick spray. Place a thin layer of marinara on the bottom. Place half of the cauliflower mixture on bottom of pan; spread evenly. Top with half of the spinach, then half of the eggplant, then half of the marinara, and 1 cup of mozzarella. 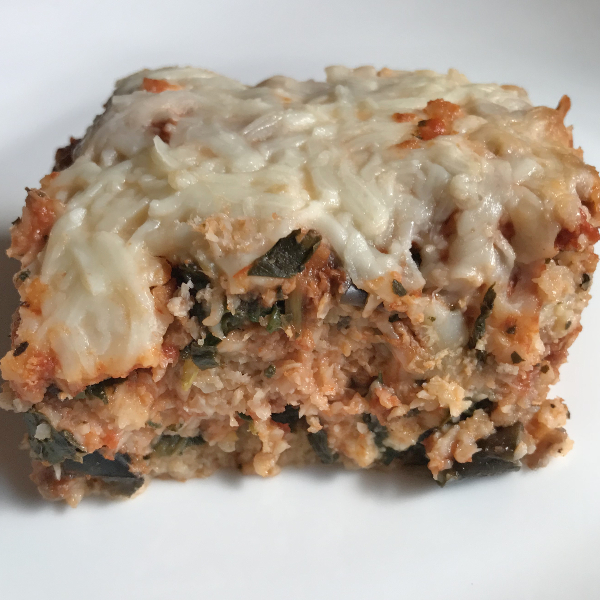 Repeat with a second layer of cauliflower, spinach, eggplant, and marinara. Cover pan with foil, and bake for 30 minutes. Remove from oven, uncover, and top with remaining mozzarella. Bake for 10-15 minutes, uncovered, until cheese is melted.